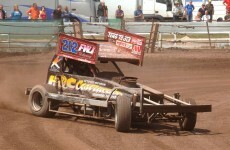 The Wainman family name has become synonymous with UK short track oval racing for over 40 years. 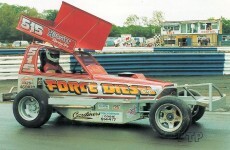 A legacy that began with a young fresh faced driver simply known as Frankie Wainman. Frankie had visited the famous Nelson stadium at the tail end of the 60’s to watch the BriSCA stock cars, a sport visited week in, week out, by thousands of spectators to see nationally famous drivers such as Stuart Smith & Willie Harrison. Frankie well and truly caught the stock car bug, but it was not enough for him to just watch this spectacular form of motor-sport, he wanted to be a part of it. A mere three weeks was spent constructing a car of his own design, before Frankie made his debut at Rochdale Stadium in the year of 1970, racing under the number of 212. Despite being ‘fenced’ in his first meeting by non other than Willie Harrison, success came steadily. By 1972, Frankie had grabbed his first Heat Win and had climbed the handicap system to the top grade (at that time) of Star, also affectionately know as Red Top due to the obligatory roof colours used to denote driver grades for the spectators. 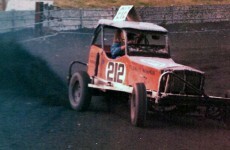 1973 saw his first Final Win, which he achieved at Nelson, the very same stadium that had seeded his love for the sport just a few years earlier. This swift rise to the top levels of the sport combined with his always happy personality had also quickly brought him to the attention of the packed terraces of spectators, and he just as quickly gathered a large following of fans. This attention from the fans helped develop a good friendly on-track rivalry between Frankie and other crowd favorites, most notably Stuart ‘The Maestro’ Smith. Many of the crowd choosing to stand in one camp or the other, a ‘Smith’ fan, or a ‘Wainman’ fan – but never both. Picking up the nickname ‘Smiler’ due to his permanent infectious smile, Frankie would go on to entertain the crowds for nearly 40 years, and collecting along the way just about every accolade going in the sport, including the World & National titles, and being amongst the sport’s inaugural Superstars grade when it was created in 1976 (a position he held for a record breaking unbroken sequence of 10 years). These achievements cemented the Wainman name firmly in the world of BriSCA F1 stock car racing, so it was of no surprise when his eldest son, also called Frankie, followed him into the sport in 1987 at the tender age of just 16, racing the number 515 under the name of Frankie Wainman Junior. 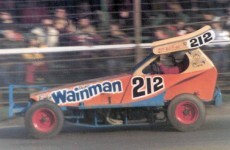 Frankie Wainman Jnr, took his fathers lead of building his own car to enter the sport with, and through both his engineering skills and his race craft (honed from his experience in the Mini-Stox series), very quickly made a name for himself as a driver to watch, winning Heats and Finals within weeks of entering the sport. To date, there is nothing that ‘Junior’ Wainman has not won in the world of BriSCA F1, and through his FWJ Racing workshop has further stamped the Wainman name into legendary status by building cars for a large percentage of the drivers racing BriSCA F1 stock cars today. In 2007, and after 38 fantastic years, Frankie Wainman Senior (as he is now affectionately known) decided to retire from the sport and hand over his famous 212 racing number to his then 16 year old son Daniel. Although Daniel made his BriSCA F1 debut in late 2007 at his fathers testimonial meeting, it was 2008 when Danny Wainman made his true move into the sport. Like his father before him, Danny quickly rose up the ranks to take Star grade, and finished the year with the World of Shale title in his belt. During this time, it is of no coincidence, that the Wainman sons found themselves racing against Andy & Stuart Smith Jnr, sons of the great Stuart Smith. Once again the BriSCA F1 fans found themselves watching and cheering on a fascinating on-track rivalry, and once again having to decide whether to be a ‘Smith’ fan or a ‘Wainman’ fan. In 2009, the Wainman’s made more BriSCA F1 history, but of a different sort, when the BBC decided to follow the whole Wainman family for a complete year, for a documentary about the famous Smith vs Wainman 40 year rivalry. The program aired in 2010 in a late evening slot on the main BBC1 channel, under the title of Gears and Tears, pulling in millions of viewers. The documentary had a profound affect on the sport, pulling in many new fans to the sport, and pulling back many fans who had drifted away over the years. This resulted in the 2010 BriSCA F1 World Championship event held at Coventry being packed to the rafters with the largest crowd the sport had seen in over a decade. As the Wainman family moves forward and looks to the future, the next generation of Wainmans are beginning their journey, as Frankie ‘Smiler’ Wainman’s grand children, Phoebe & Frankie Junior Jnr begin their Mini-Stox careers.